WASHINGTON — The U.S. Army has made good on a new push to buy commercially available products by issuing a contract to both Raytheon and Palantir Technologies to provide solutions for its struggling intelligence analysis system, the Distributed Common Ground System-Army (DCGS-A), according to a March 8 contract announcement posted to the Pentagon’s website. The Army has been criticized in recent years for not buying enough commercial off-the-shelf technology and instead spending billions and many years to build the capabilities itself. DCGS-A is a poster child for how the Army has struggled to develop and field a highly technical capability while ignoring the pace of technological development outside of the defense world. It’s also an example where existing technology could have already provided a functional capability without further development. But the service is showing, through its contract award, that its epic legal dispute with Palantir is water under the bridge. Palantir sued the Army in 2016 in the U.S. Court of Federal Claims for what it says was an unlawful procurement solicitation for the service’s next iteration of DCGS-A that shut the company’s commercial offering out of the competition. The lawsuit argued the Army should be stopped from moving forward on an unlawful and risk-prone software development project that would reinvent the wheel at a very high price. The court ruled in favor of Palantir in October 2016 and upheld Palantir’s central legal argument that the Army violated a 1994 law — the Federal Acquisition Streamlining Act — by not conducting the market research needed to determine if commercially available items could meet its needs with or without modification. The judge ordered the Army to go back and seriously look at whether commercial products existed to meet it needs. And that is exactly what the Army did, choosing Raytheon and Palantir to build DCGS-A platforms in what its called Increment 1, Capability Drop 1. The new contract’s ceiling is $876 million with a period of performance of 10 years, according to a March 9 Army statement. The first capability drop will be a commercial hardware and software solution “to support intelligence analyst operations at the tactical echelon,” the statement notes. Hardware includes ruggedized laptops and a “displacement” of the Intelligence Fusion Server at the battalion echelon to make the system more expeditionary. Software will allow analysts to use the system in disconnected, intermittent and limited bandwidth environments and will be much easier to use than the current system. Raytheon and Palantir will supply systems as part of the first delivery order under the contract, although it is unclear how much each company will receive to provide those systems. The Army will competitively assess the systems in a “test-fix-test” phase with soldier involvement, which aligns with the service’s stated acquisition reforms, particularly related to network solutions. The first capability drop “directly addresses the soldier’s feedback for improving usability, will enhance the tactical military decision making and intel processes, and support situational understanding at the tactical level,” Col. Robert Collins, the Army’s program manager for DCGS-A, said in the statement. While Palantir has not yet announced what it will be providing to the Army for testing, court documents from its lawsuit stated that its data-management product — Palantir Gotham Platform — does exactly what DCGS-A was trying to do and comes at a much lower cost. Raytheon, which has been one of the many players in earlier versions of DCGS-A, will supply its FoXTEN open architecture software product, according to Todd Probert, company vice president for Mission Support and Modernization within Raytheon’s Intelligence, Information and Services business, in a statement provided to Defense News. FoXTEN “can be loaded onto a commercial laptop and easily deployed to and used by soldiers operating in the field,” he said. 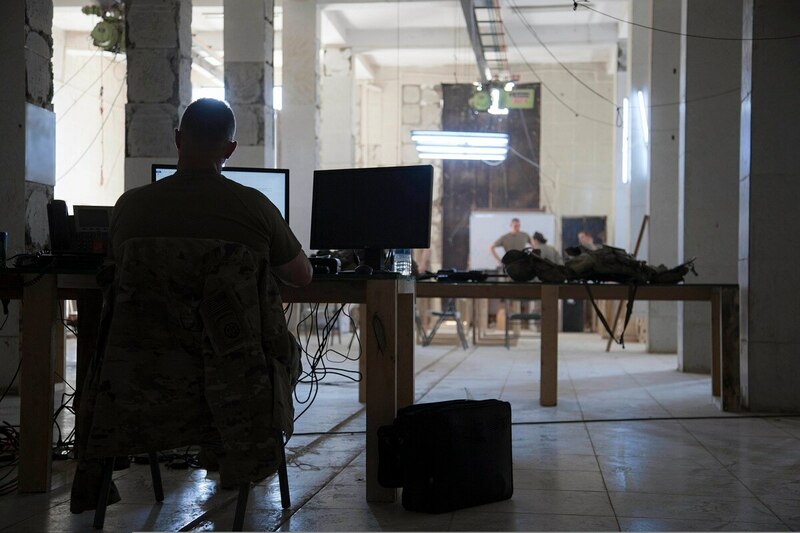 The product, “connects warfighters to intelligence from numerous agencies and sources, quickly and easily allowing them to make mission decisions when operating in remote environments,” Probert added. The system is also designed to be intuitive enough that it cuts training time from 24 hours to 8, Probert said. Users of previous DCGS-A systems argued the system was so complex too much training, too often, was needed to operate it. DCGS-A was initially deployed to Iraq and Afghanistan as a quick-reaction capability and used commonly to track insurgents’ improvised explosive device networks. It’s gone through several iterations with incremental improvements, but complaints of various aspects of the system continue to bubble to the surface. Several lawmakers have gone after the system, namely Rep. Duncan Hunter, R-Calif., who famously fought with then-Army Chief of Staff Gen. Ray Odierno during a 2013 House Armed Services Committee hearing, where he blasted the system and referred to reports from the field that DCGS-A was anything but functional and easy-to-use. Signs changes were afoot for the service’s intelligence analysis framework emerged in the spring of 2016 when Army Chief of Staff Gen. Mark Milley, acknowledged during a Senate Armed Services Committee hearing that DCGS-A was not performing well at the tactical level and that it might be time to look at other options. During the most recent Network Integration Evaluation at Fort Bliss, Texas, soldiers there admitted that its DCGS-A system was packed up in a corner because the unit fried two server stacks and the systems were having significant problems operating in the level of austerity out in the desert environment of the fort.